Game Courier can support an endless variety of Chess variants, and to date it supports over 1100. This page features a selection of popular and recommended games you can play on Game Courier. The full list can be browsed with the links provided immediately below. Here are the world's most popular Chess variants. The Asian variants are depicted below with pieces that use Asian characters, but western sets are also available for these games. All of these games come in a variety of board/piece combinations, and players may further configure them to their own liking. The following presets enforce the rules. For those who are new to Chess variants, you might like to begin with those that are more like Chess. The learning curve will be smaller, and it will give you a taste of what Chess variants have to offer. 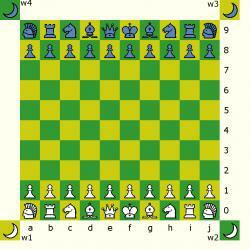 Invented by Bobby Fischer as a way to eliminate the use of opening theory in Chess, Fischer Random Chess is Chess with a randomized setup and modified castling rules. Similar games include Transcendental Chess and Brand X Random Chess. Double move variants, which allow a each player to move twice per turn, have been popular for correspondence games, because they allow the games to move faster. 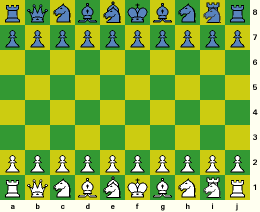 Marseillais Chess may be the oldest and best known of double move variants. My own Extra Move Chess puts some restrictions on the second move that help make the game feel more Chess-like. Mats Winther has created a couple double move variants in which you move a Pawn before making a regular move: Twinmove Chess (uncompelled) and Twinmove Chess (compulsory). In Chess, the Queen is a Rook/Bishop compound. The two compounds missing from Chess, the Knight/Bishop and the Knight/Rook, are the two most popular Chess variant pieces outside of Chess. Commonly used in 10x8 variants, they date back to Carrera's Chess in 1617. Modern Carrera's Chess uses the same setup with the rules of the early 20th century game Capablanca Chess. Some recent additions to this family keep all Pawns protected in the opening array, some of the best being Embassy Chess, Schoolbook Chess, and Victorian Chess. My own games of this sort include Grotesque Chess and Univers Chess, though I consider them flawed. There is also the randomized setup version Capablanca Random Chess. One popular 10x10 variant with these pieces is Grand Chess. The most distinctive piece from Chinese Chess is the Cannon, which moves as a Rook but captures by hopping over an intervening piece. Games that use the Cannon with Chess pieces include Jean-Louis Cazaux's Shako, David Paulowich's Mir Chess, and my own Eurasian Chess and Yang Qi. In Shogi, the Japanese form of Chess, players keep the pieces they capture and may later drop them back on the board as their own. The most direct applications of this idea to Chess are Mad Queen Shogi, Crazyhouse and Chessgi. Similar games include John Leslie's Hostage Chess, which has been featured in D. B. Pritchard's book Popular Chess Variants, and my own games Shatranji, Mortal Chessgi, and Clockwork Orange Chess, each increasingly more different from Chess. 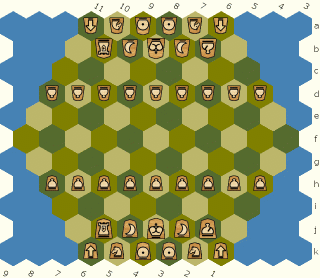 These games translate Chess to a hexagonal board, which has 12 directions instead of just 8. The most popular may be Glinski's Hexagonal Chess, but the most accurate translation of Chess to a hexagonal board is McCooey's Hexagonal Chess. Here are some popular Chess variants that are not already listed in any of the other sections. They are not as close to Chess as those listed above are, and none are by me. 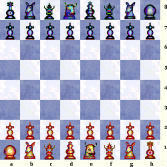 Ralph Betza has called Chess with Different Armies his best and most Chess-like of variants. For this game, he has carefully put together a few different sets of pieces that are supposed to be comparable in power to the pieces in Chess but move differently. 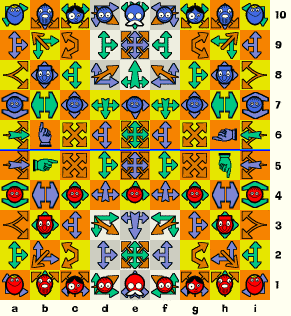 This game comes in a variety of permutations, pairing each army against each of the others, as well as against the usual Chess army, which he calls the Fabulous FIDEs. While pieces in Chess differ in their powers of movement, pieces in Ultima differ primarily in their powers of capture. This game has inspired such recent variants as Roberto Lavieri's Maxima and Peter Aronson and David Howe's Rococo. Invented by Michael Nelson, Pocket Mutation Chess starts off like Chess but allows pieces to mutate into a variety of Fairy Chess pieces of comparable worth. 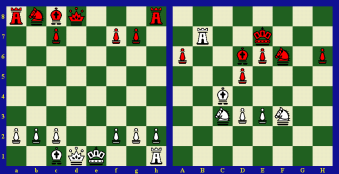 In Vernon Parton's Alice Chess, inspired by Lewis Carroll's Through the Looking-Glass, pieces alternate between two different boards with each move. 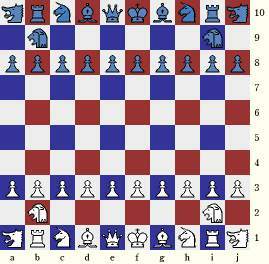 Invented by Peter Aronson, Anti-King Chess II starts out with each Anti-King attacked by opposing pieces, and the object is to "checkmate" the Anti-King by putting it in a position where it is not attacked by any piece and cannot end its turn with any piece attacking it. Omega Chess is a commercial variant that introduced the Champion and the Wizard, two pieces that have since become rather popular. Besides being the inventor of Game Courier, I am also an inventor of Chess variants, and one of the reasons I created Game Courier was to have a PBM system that included my own games. Here is a selection of some of my favorites among my own games. These presets all enforce the rules, and some come in other piece/board combinations. Caïssa Britannia is a British themed variant with a royal Queen, a non-royal Prince Consort, Anglican Bishops, and three heraldic pieces: the Lion (for England), the Unicorn (for Scotland), and the Dragon (for Wales). 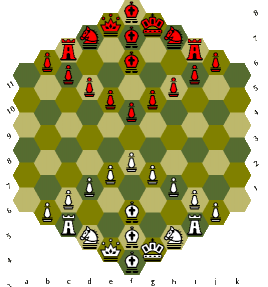 Grand Cavalier Chess is a decimal version of my earlier game Cavalier Chess. 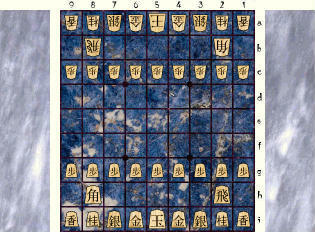 In this game, Rooks, Bishops, and Kings are replaced by counterparts that also move as Knights, the Knight is replaced by a Nightrider, which can make consecutive Knight moves in the same direction, the Pawns are replaced by Chinese Chess Knights, which move as Knights but can be blocked, the Queen remains the same, and Cannons are borrowed from Chinese Chess. Taking inspiration from Grand Chess and Xhess, this game improves on Cavalier Chess by giving the pieces more space and by removing some of the pitfalls in the Cavalier Chess opening array. Hex Shogi 91 is an adaptation of Shogi to a 91-space hexagonally-shaped hexagonal board. Another one, played by the same rules, is Hex Shogi 81, played on a parallelogram-shaped hexagonal analog of the usual Shogi board. One of my other favorite Shogi variants is Kamikaze Mortal Shogi, created with Roberto Lavieri. 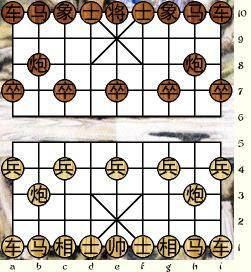 Play begins with the usual Shogi equipment, but captured pieces demote in rank, captured Pawns demote to Kamikazes, and Kamikazes die whenever they capture a piece or get captured. It adds mortality (a common feature of most Chess variants) and kamikaze suicide attacks to Shogi. Storm the Ivory Tower is a Smess adaptation of Chinese Chess. Each piece moves like the corresponding piece in Chinese Chess with the difference that the arrows on the space it moves from determine which directions it may move. Gross Chess is a large variant that brings together pieces and rules from Grand Chess, Grotesque Chess, Eurasian Chess, and Omega Chess. 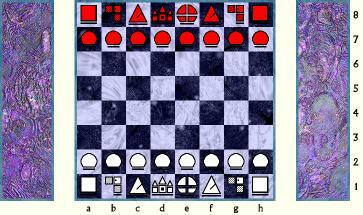 It is intended to be similar to Chess but on a larger scale with a wider assortment of pieces. Games for Game Courier. The many games you can play online with Game Courier. Test comment. My session was not being recognized on play.chessvariants.com, but the comment link led to chessvariants.com, where it is working. A preset for Chess that doesn't enforce any rules is already available for Chess. It is the default configuration for Game Courier before any changes are made, and the Editor link on the main Game Courier page will take you to it. The others aren't difficult to make if you need them. Just begin with a preset that enforces the rules and delete all the code for enforcing the rules. 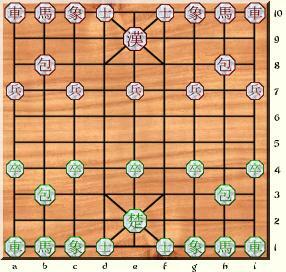 I think, it needs special presets for chess, shogi and xiang-qi, wich DO NOT enforce rules! They'll help to playtest games, played with same board pieces, but with different rules. 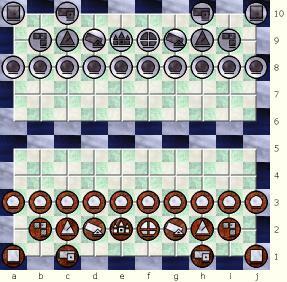 And it's better if all 3 will have benches for captured pieces, as in shogi. Greetings to all Chess Variant players! I have often found myself looking to play a live game on the Play By Mail Game Courier, but not able to connect with anyone that can play at the same time. So I have created a chat room (with no requirements to download any software) to help pull fellow gamers together online at the same time. The chat room address is http://www.chatzy.com/574469514839. I titled the room 'Chess Variants Lounge'. Pretty simple to access and no registration required. Hope to find some of you there looking for a live game to play. Larry Wheeler gave me some good advice today on how to fix the problem, which I took so the problem should be fixed. Apologies for that, David.